Located on the 20th floor of the west tower in the Sloppy Floyd Building just across from Georgia's State Capitol building, the Floyd Room offers a stunning view of Underground Atlanta and the downtown area. On a clear day, visitors to the Floyd Room can see as far as Georgia’s Stone Mountain. 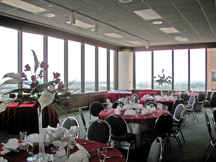 The Floyd Room, complete with a dance floor, can accommodate 300 guests for a seated event and 450 for a stand-up reception. The Floyd Room is an ideal location for breakfast meetings, seminars, luncheons or evening receptions.